With better odds in favour of the player, European roulette is always preferential when available. Find out why European roulette is the most popular roulette variant with online players and where you can try your luck at this sophisticated, classic casino game. European roulette follows the same format of all roulette variants in that the aim of the game is to predict the outcome of where the ball will land once it’s been spun on the roulette wheel. Before the wheel is spun, players move their betting chips to their desired place on the roulette table to signify their prediction. When playing online, this is easily done by clicking on the chip with the value you wish to bet and subsequently clicking the space on the betting table you wish to play. Once you’re happy with your bet, click ‘spin’ or ‘play’ and watch as the computer generated wheel whirls around before coming to a stop. The winning number will be clearly announced and any wins you’ve made will be automatically credited to your account before giving you the option to bet again. When playing in a land based casino, often the only roulette variant available is American roulette. This is because American roulette has a higher house edge and therefore comes with worse odds for the player, hence why it’s preferential to casino vendors. The beauty of playing online is that casino operators have lower overheads and can afford to offer games with lower house edges, so European roulette is widely available at all leading casinos, giving the player the choice of which variant they wish to play. The reason European roulette is the best choice is the Euro roulette wheel only comes with one zero, unlike the American wheel which has one single zero and one double zero. The rules of both types of games are virtually identical, but the small addition of an extra zero brings the house edge up significantly, from 2.70% in European roulette to 5.26% in American roulette. European roulette is the best choice for every real money player, online or at your local land-based casino. Why? 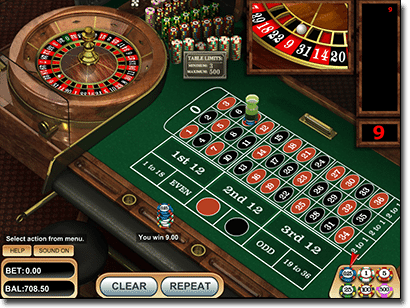 For the simple fact your odds of winning are better than with any other variant – aside from French roulette, which incorporates unique player-friendly rules to the usual game while retaining the single-zero of European roulette. As mentioned above, the European roulette wheel only has one zero, along with the numbers one through 36. Numbers are red or black except for the zero which is green, and appear clockwise in a random order from 0, 32, 15, 19, 4, 21, 2, 25, 17, 34, 6, 27, 13, 36, 11, 30, 8, 23, 10, 5, 24, 16, 33, 1, 20, 14, 31, 9, 22, 18, 29, 7, 28, 12, 35, 3 to 26. The betting table consists of a grid of three numbered rows and three sections separated as 1st 12, 2nd 12 and 3rd 12. This is where the chips are placed to signify your bet. If you’re looking for the most crystal clear, suave Euro roulette games on the Internet look no further than our recommended casinos. These sites offer premium instant-play software with roulette games from such big name gaming developers as Microgaming, NetEnt, BetSoft and Play’n Go, with live dealer roulette variants from Evolution Gaming, Ezugi and Microgaming. These venues all accept Australian players and allow deposits in AUD using a range of secure deposit options including Neteller, Skrill, Paysafecard, POLi, Visa and MasterCard. New players clicking our links to join will also receive some hefty welcome bonuses upon signing up. Odd or even – bet the ball land on an odd or even number, with wins paying 1:1. Rouge or noir – bet the ball will land on red or black, with wins paying 1:1. 1 to 18 (Manque) – bet the ball land between one and 18, with wins paying 1:1. 19 to 36 (Passe) – bet the ball will land between 19 and 36, with wins paying 1:1. Dozen bet – bet the ball will land on either 1 to 12, 13 to 24 or 25 to 36, with wins paying 2:1. Column bet – bet the ball will land on a number within one of the three vertical columns, with wins paying 2:1. Snake bet – bet the ball will land on either 1, 5, 9, 12, 14, 16, 19, 23, 27, 30, 32, and 34, with wins paying 2:1. Straight – bet the ball will land on a specific number, with wins paying 35:1. Split – bet the ball will land on two specific numbers, with wins paying 17:1. Street – bet on three numbers within a horizontal line, with wins paying 11:1. Corner (Square) – bet on a square of four numbers, with wins paying 8:1. Six line (Double Street) – bet on two adjoining streets, with wins paying 5:1. Roulette is a game of chance, which means even if you have heard of a fantastic sounding roulette strategy, your chances of winning are the same no matter what strategic move you make. It’s important to remember that roulette is entirely luck based and every player has the same chance of winning. Choosing to play European roulette over American is a good strategy in itself in that the odds are more favourable, but beyond that just set yourself limits and enjoy roulette for the fun, exciting game it was intended to be, while hopefully picking up some wins along the way. Try your luck at European roulette at one of our most highly regarded casinos, Royal Vegas Casino, where you can also sample American roulette to get a feel for the difference between the two games.